How Do You Use the Distributive Property to Simplify an Expression? In this tutorial you'll see how to apply the distributive property. Remember that this is important when you are trying to simplify an expression and get rid of parentheses! Sometimes what's simple for some is hard for others, and so simple seems like a pretty subjective word. But when it comes to algebra, the simplest form of an expressions is very well defined and is very specific- there's really nothing that subjective about it. So watch this tutorial and see exactly what simplest form means! 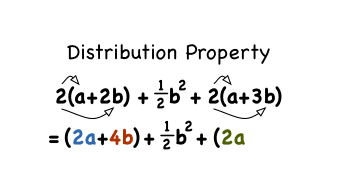 What is the Distributive Property? The distributive property is a very deep math principle that helps make math work. It's the rule that lets you expand parentheses, and so it's really critical to understand if you want to get good at simplifying expressions. So check out the tutorial and let us know what you think! How Do You Multiply Monomials? Multiplying monomials? Group constants and like variables together before you multiply. See how to find the product of three monomials in this tutorial. How Do You Multiply Binomials Using the Distributive Property? Multiplying together two binomials? Not a fan of the FOIL method, or just want to see another way? Check out this tutorial! You'll see how to distribute one binomial into the other in order to find the product. You get the same answer no matter which method you use, so be sure to add this method to your arsenal!